Esther Lurie was born in Liepaja, Latvia, to a religious Jewish family with five children. Her family were forced to leave during World War I because the city's importance as a military port. In 1917 they shifted to Riga, where Lurie graduated from Ezra Gymnasium (high school). She already showed artistic talent in kindergarten and began to develop professionally from the age of fifteen, studying with various teachers. From 1931-1934 she learned theatrical set design at the Institut des Arts Décoratifs in Brussels, and afterwards studied drawing at the Académie Royal des Beaux-Arts in Antwerp. In 1934 Lurie migrated to Palestine with most of her family and worked at various artistic activities. She designed sets for the Hebrew Theatre, as well as works for the Adloyada in Tel Aviv, the Bialik exhibition and the Eastern Fair. When events limited theatrical activity in Palestine, she devoted herself to drawing - producing many portraits. Her favorite subjects were dancers and musicians. She also travelled to many kibbutzim, painting the landscapes of Palestine, and her works were exhibited in kibbutzim dining rooms. Her first exhibition took place in Kibbutz Geva in 1937. In 1938 she was accepted as a member of the Painters and Sculptors Association in Palestine. She held solo exhibitions in Tel Aviv, Jerusalem and Haifa. In 1938 she won the Dizengoff Prize for Drawing - the most prestigious prize - for a work entitled "The Palestine Orchestra". This was shown at the general exhibition of Palestine artists in the Tel Aviv Museum. World War II had begun while she was in Lithuania and during the Nazi occupation (1941-44) she was imprisoned in the Kovno ghetto along with the other Jews. As soon as she entered the ghetto, in mid-1941, Lurie began to sketch views of her new world. She has left behind a detailed written testimony of her life and work during World War II. This combination of literary and visual testimony make up a "living witness" (the name she would later give to one of her books). 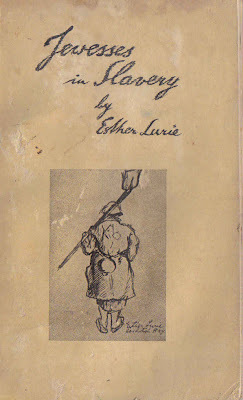 They enable us to enter deeply into her life as an artist during this period under these difficult conditions Lurie drew everywhere in the ghetto, including the various workshops. Among the workshops she was permitted to visit was the pottery workshop. During her visits there, Lurie got the idea of asking the Jewish potters to prepare a number of jars for her. She would use these to conceal her art works if the situation worsened. The situation did grow worse. After the deportation of 26 October 1943, in which 3,000 ghetto inmates were removed to forced labor camps in Estonia, Lurie hid her art collection - approximately 200 drawings and watercolors of 25 x 35 cm - in the large jars she had prepared in advance. Some of her works were photographed beforehand for ghetto's hidden archive. Lurie was liberated by the Red Army on 21 January 1945. In March 1945 she reached a camp in Italy, where she met Jewish soldiers from Palestine who were serving in the British army. 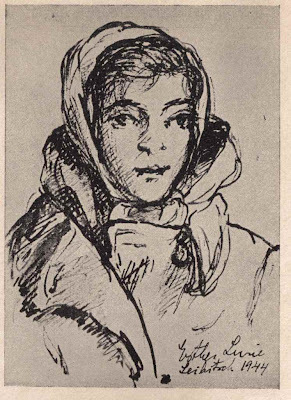 One of them, the artist Menahem Shemi, organized an exhibition of drawings from the camps, which resulted in the publication of a booklet Jewesses in Slavery. This contained drawings by Lurie from Stutthof and Leibitz and was published by the Jewish Soldiers' Club of Rome in 1945.